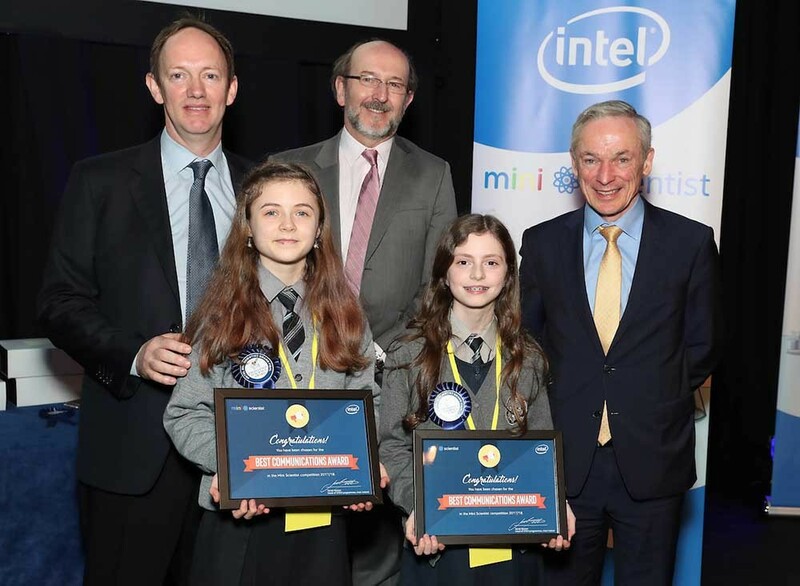 Winners of the Best communicators award at the 2018 Intel Mini Scientist CBS Primary School, Ennis, Co. Clare Amelie McGrath and Victoria Wiktoriafafara pictured with Vice President of New Technologies Group, Intel Noel Murphy, DCU president Brian MacCraith and Minister for Education and Skills, Richard Bruton TD. Students from two Co Clare schools have won top awards at a ceremony in Dublin. The Best Communications award went to CBS, Ennis for their project “The power of Tsunamis”. Another Clare school scooped one of the runner-up awards. Barefield National School has been recognised for their “Rough sleep – Not anymore” project presented by Kadi Farrell, Ayesha Rahman and Grace McGloin. 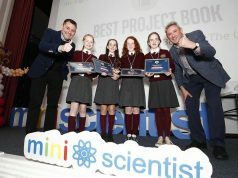 Students from across Ireland took part in the Intel Mini Scientist Grand Final, an event which is the culmination of a nationwide competition which began in September 2017. This year there were nearly 3,000 projects exhibited as part of the Mini Scientist competition and the Grand Final brought together the top 28 projects from across the country. The Intel Mini Scientist, which is now in its 11th year, gives primary school students from 4th, 5th and 6th class, the chance to explore science through project based learning and exhibitions. The first phase of the program involves students participating at local level exhibitions where Intel judges visit the participating schools, choosing two winning projects in each. The second phase saw each of these winning projects take part in the Mini Scientist Regional Finals which were hosted throughout December in Dublin, Shannon and Cork. The 2017 / 2018 initiative was another exciting year for the Mini Scientist competition with almost 8,000 students from 135 schools in 18 counties of Ireland taking part in the Grand Final event. At the Grand Final, held in the Helix at Dublin City University, the participants exhibited their projects for a panel of judges, made up from Intel employees and external representatives from across industry and academia, who had the difficult task of choosing the winning projects. Each of the projects included visual displays, projects books and practical experiments based on a scientific area aligned with the national primary science curriculum. Richard Bruton T.D., Minister for Education and Skills presented the prizes to the winning projects at the Grand Final. The Grand Final was filled with innovative and imaginative projects, put together through months of hard work and the judges, after a very difficult task of deliberation selected their winning projects. For more information about the grand final event or to sign your school up for the Mini Scientist competition visit www.intel.ie/miniscientist.